You may think that your L-shaped kitchen is cramped and small without any hope of looking fantastic. However, in this Ideabook, we'll show you just how amazing this type of kitchen can become, with the addition of sensational colours, charming materials and of course some imagination and creativity. That dull L-shaped kitchen will quickly become a haven of style and comfort in your busy home. These 6 ideas are sure to inspire you! The kitchen is the heart of the home, and needs to be a welcoming space for family and friends to feel at ease. 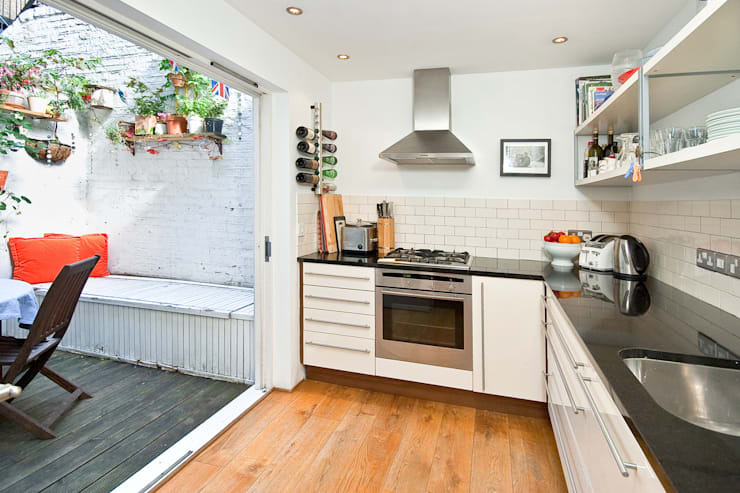 Well, this modern kitchen may be small in size, but makes up for it in fabulous style! The use of glossy cabinet doors, sleek countertops and all-white design, along with perfect lighting adds just enough drama to this modern kitchen. 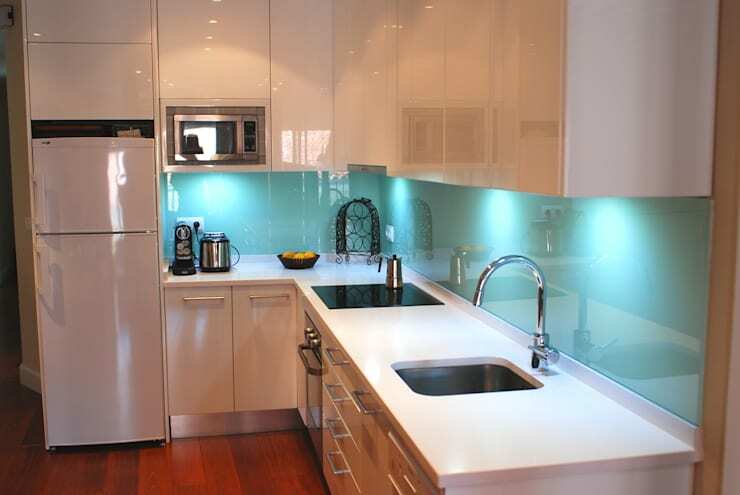 The superb blue splashback creates an interesting effect that is unique yet vibrant. It's a minimalist kitchen with a quirky side. Modern kitchens are often part of an open-plan layout that includes a living room and dining area. 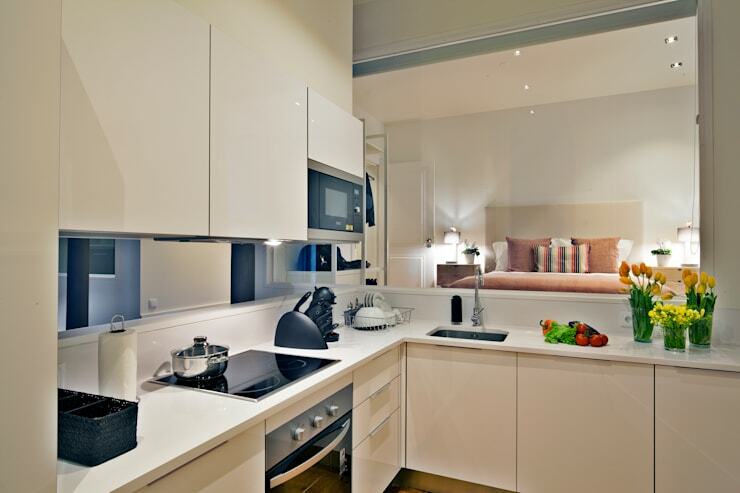 The modern appliances are perfectly housed in this all-white unit, allowing plenty of work space on top. This kitchen has an undeniable industrial charm, with the interior designers opting for brick-like wall tiles to enhances the style. 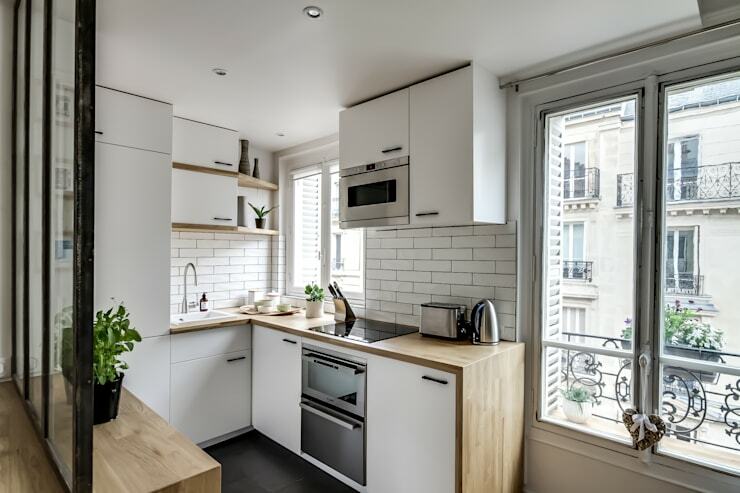 As a result of the compact size, there isn’t enough space for a dining table, but this kitchen is cosy anyway with its white cabinets and wooden countertops. 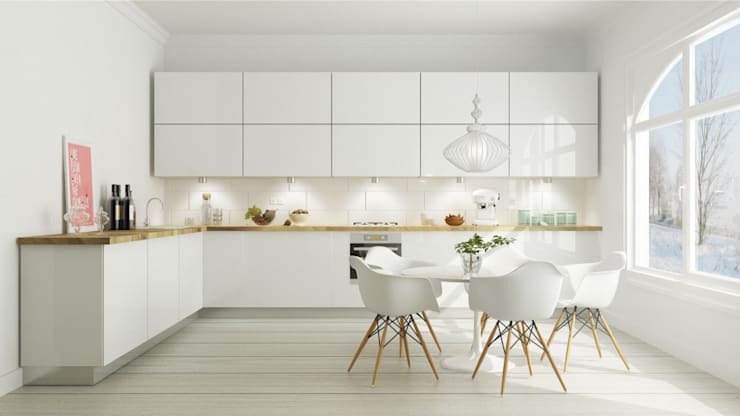 All-white kitchen décor is a fantastic option for a clean and uncluttered look that is also spacious in design. This Scandinavian-inspired kitchen includes a simple dining area too, perfect for those quick meals before heading off to work. It’s well-lit and comfortable in every aspect. The L-shaped kitchen makes a great addition to a home with rustic flair—or how about a home that has an easily accessible terrace for fresh air and al fresco dining? We've come to the end of our Ideabook, but let's take minute to admire this cosy and cute pastel kitchen! 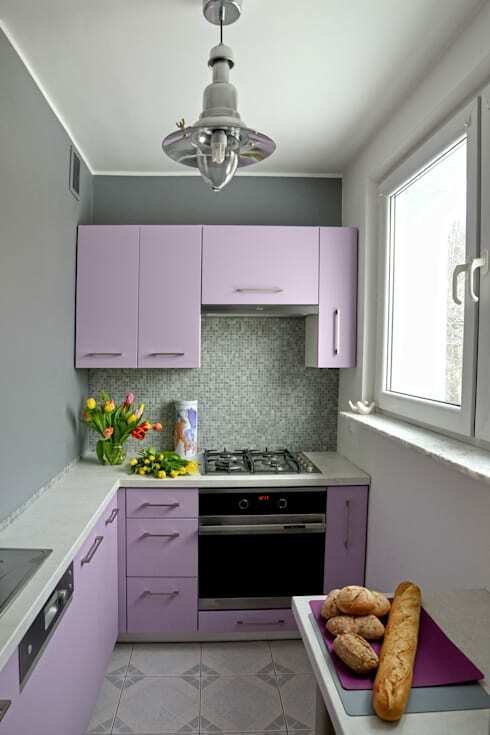 The choice of lavender as a feature colour has an enchanting effect, and although the workspace is minimal and the cabinets compact, this kitchen is utterly adorable. While a modern kitchen may be all the rage these days, there's nothing as classic and cosy as these 8 rustic kitchens you need to see. Are you a fan of an L-shaped kitchen?